“Jobs, jobs, jobs!” Every politician at every level of government trots this out during every election. It's an easy phrase to say and pretty safe because not many voters are against job creation. While it's easy to say, however, it may not as easy as it sounds. Truth be told, the jobs landscape is moving so fast that anyone who thinks he/she has a magic, long-term, job creation formula is in for a rude awakening. The World Economic Forum has labeled this the “Fourth Industrial Revolution.” According to the Forum, by 2030 we may not even remember what the world of work was like back in “the good old days.” Think about this. Children entering kindergarten this year will be just graduating from high school. Seniors graduating this year will only be thirty years old. Is that fast enough for you? Several studies are available that deal with trying to identify those jobs or occupations which will disappear or be drastically scaled back by 2030 (sources listed below). These include: drivers, dispatchers, farmers, jewelers, printers and publishers, cashiers, delivery, travel agents, manufacturing, librarians, receptionists, insurance underwriters, bank tellers, and inventory managers. So, with all this in mind, how are workers going to survive in this futuristic scenario? The World Economic Forum concludes: “The Fourth Industrial Revolution is changing the workplace fast, and we will need to adapt our skills to be ready for it. 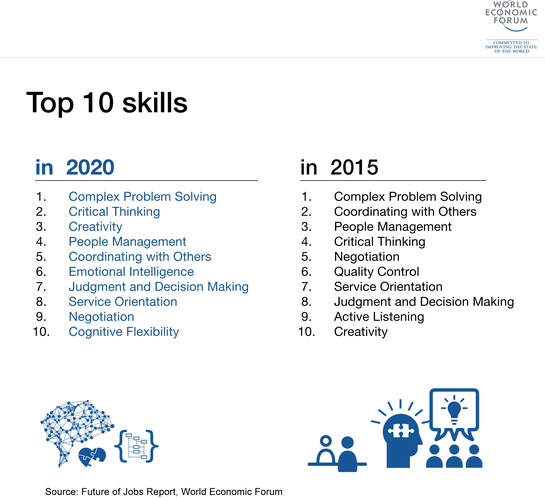 The top ten skills cited by the forum as essential for workers by as soon as 2020 are: complex problem solving, critical thinking, creativity, people management, coordinating with others, emotional intelligence, judgment and decision making, service orientation, negotiation, and cognitive flexibility. Ever hear a politician mention these? So with these changes in the jobs outlook moving at such a breakneck pace, how do we assure our children that they will be ready for this? Plus, as these changes take place, how can we position our businesses for success and growth? Specifically, is there anything a region or locality can do now to ensure its future viability? The message is pretty clear. The jobs picture will dramatically change very rapidly within the next ten to twenty years. Those states, regions and communities that invest in quality K-12 education will be the economic leaders. Those who do not will just have to gamble that there's a magic formula that will come to their rescue.